Blogging for your cannabis businesses, and content in general, for the cannabis industry, is a little different. We’re going to start with some critical points for you to consider. This is based on data for B2B and B2C companies, not just in the cannabis space. The important difference is that as the marijuana industry is still quite new, there isn’t nearly as much content out there as there is for almost every other industry. For this reason, cannabis companies should write more, blog more, video more, and engage more. This is both for education of new users, as well as to take advantage of one of the safest all-around legal ways to promote your business. Read more on why blogging for your cannabis business is even more important than other industries here. Read more on what blogging and other content is, and how to get started with it, here, here, and here. Yes. Yes. Pardon me, I’ll get to that now. No sugar coating here. I’m going to start with the hard honest truth. The data consistently show that, “the more blogs you publish, the more traffic, leads, and sales your business will generate” (Writtent.com). Period. When blogging for your cannabis business, how LONG do the posts need to be? The answers to these questions, of course, boils down to the deciding factor of all business—time and money. Given that most of us already understand that the more you blog the better, marijuana businesses are left with deciding how important it is for each number of blogs they produce. Here is what the data show from hubspot’s newest benchmark statistics. Lucky for us, Hubspot nicely gives us a lot more to go on than just how many, and breaks it down into size of the company and how it affects the data. This means that once you get to 11+ posts per month, that there is a real, noticeable, difference in the data. And further than that, there is a real difference in B2B and B2C companies. You can see from this chart that B2C business have a radical shift when they move from 4-5 a month, to 6-10. 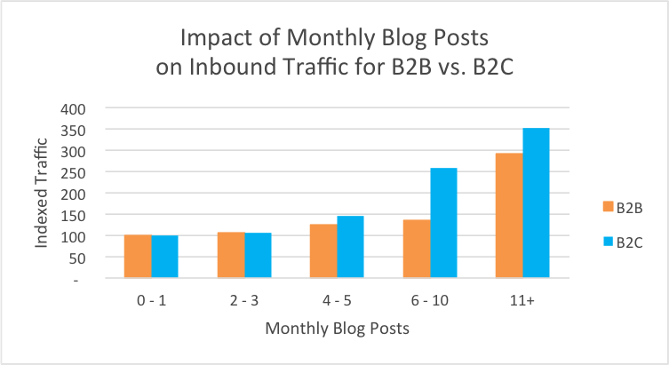 If you are a B2C business, getting in those extra monthly blogs can make a huge difference. Some great news about all blogs is that once you have some quality content going, your indexed blogs can compound and continue giving you leads. 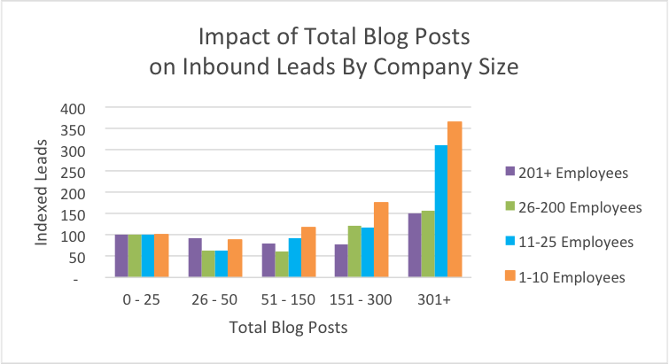 Hubspot says that 90 percent of their leads come from old blog posts. Once you get to 301 blogs, there is a sharp up-turn for business leads. This is critical to understand. It’s the somewhat unfortunate fact that even once you start blogging regularly, it takes time for your audience to find you, and then trust you, as a source. In essence, in a very natural way, your company builds its reputation and legitimacy to its patrons over time. How LONG do Your Cannabis Blog Posts Need to be? I hate to break it to you, but the days of short and sweet, easy to share and remember, 500-700 blogs are gone. I do mean gone too, as in, the bowl is cashed and a fresh new edible, vape pen, or topical awaits the coming of the already, steadily growing new audience. SERPIQ reports that the top 3 Google results, from an SEO view, are 2,350-2,500 words. 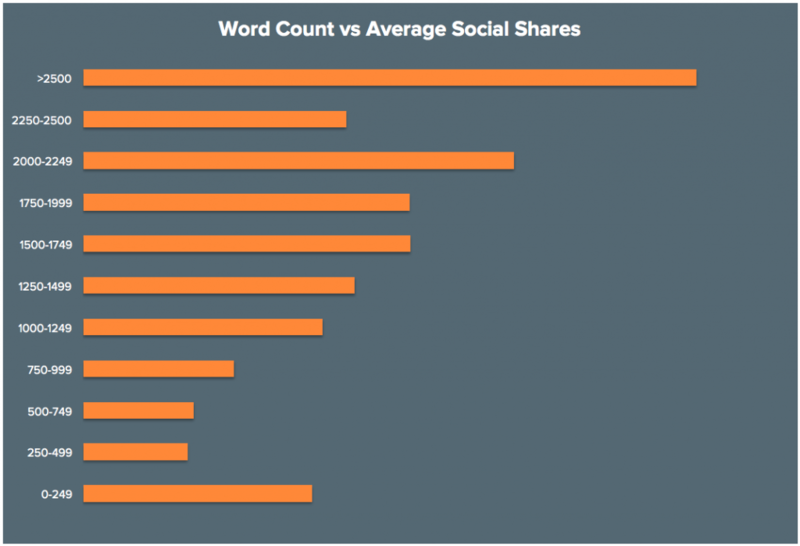 Moz says that between 1,800 and 3,000 words generates 15x more links. Super blogger Neil Patel advises at least 1,500 words for the best SEO, sharing, and engagement. When this data is assessed, it’s only including fairly stellar content. Really, all data should be titled, “1,600+ words, of REALLY AWESOME WRITING” because I promise you, the high ranking blogs are going to be good, not just long. This is where your content strategy comes into play about what you are writing about, and to whom. There is no point writing thousands of words that no one is reading. Read more about that strategy and get our free downloadable worksheet on that blog, here. Do Blogs Really Have to Be that Long? Well…the data speak for themselves. You can see by the graph above that at the very least your blog needs to be between 250-500 words, with the same value for 750-999 words. The middle area of 500-749 words is actually the worst length possible! The next jump in fabulousness is at 1000-1,249 words going up in value to 1,250-1,499 as words are increased. Then there’s actually a downward shift for 1,500-1,749. This means you should avoid this range and either cap out at 1,499 or hit your next big jump at 1,750-1,999 words. Lastly, the biggest jump is at 2,250-2,500 words. 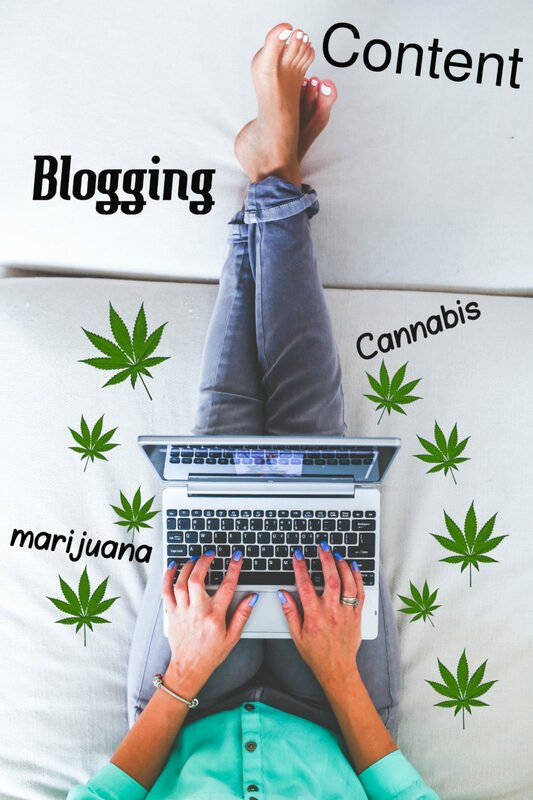 Blogs beyond 2,500 words actually have a downward trend, so you can finally rest those weary typing fingers past 2,250 words and enjoy some of your cannabis products. If you still have time! *Of course, just call us and you can hire out your expert content to someone like me! 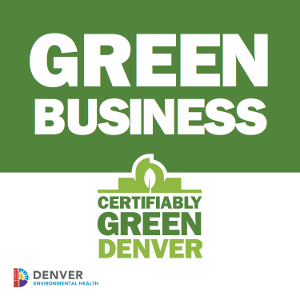 What Does This Really Mean for Your Cannabis Business? It means you have a tremendous opportunity to build your brand and customer base by regular, engaging blogging. Well, if you take a moment to soak in all the data I just threw out there, you can see the enlightening facts for yourself. The 2,250-2,500 word range is just so much better for traffic, that if you’re serious about getting as much as you can out of your blogging for your cannabis business, you should hit this mark every time. On top of this, you should go for at least 11 blogs per month, but aim for 16. 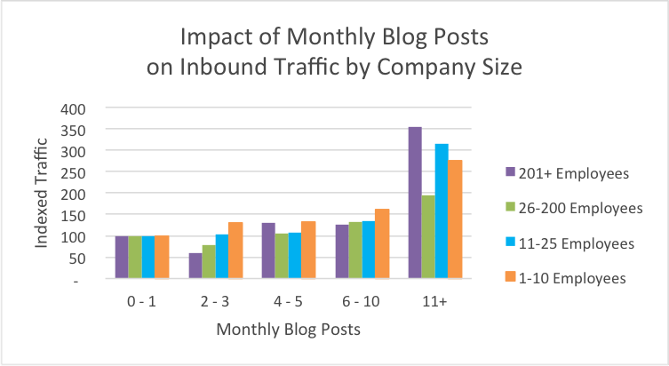 This goal of 2,250-2,500 word blogs 16+ times per month is the absolute optimum for your business. Can you do with LESS blogging for your cannabis business? Absolutely! You just will also have less traffic and leads. If you didn’t understand how important regular blogging for your cannabis business is, or any industry for that matter, you do now. We, at Team Maryjane, understand that most marijuana businesses are small and just starting out. Think of guest bloggers or trades with others you know in the industry, build your network while you build your content and reputation. 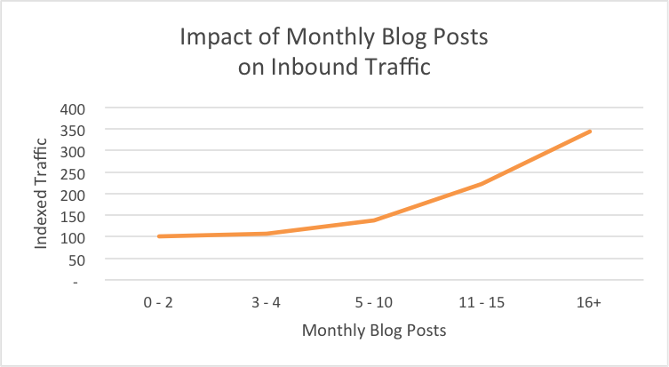 You can easily go for 6-10 blogs a month at 1,250-1,499 words and see a difference in traffic. This seems like a reasonable, middle-of-the-road blogging for your cannabis business goal and is the minimum that Team Maryjane recommends for companies that truly want to get ahead. And remember, we are here to help. We offer content writing, including blogging, for most budgets. Don’t forget that the best thing about your blogging is that all of your content has the ability to compound and get more customers over time! Blogging for your cannabis business is truly an investment for the potential future growth of your company. If you can’t afford “the best” now, consider adding sections to content later and adding more to your content budget as one of the first things you do.